Here are some of the frequently asked questions about Diana Gabaldon's upcoming novella, "Lord John and the Plague of Zombies". 1) What is "Lord John and the Plague of Zombies", and where can I find it? 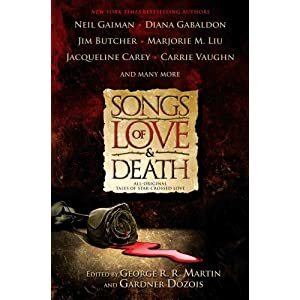 Diana Gabaldon's latest Lord John story, a novella called "Lord John and the Plague of Zombies", will be published on October 4, 2011, in an anthology called DOWN THESE STRANGE STREETS, edited by George R. R. Martin and Gardner Dozois, the same people who brought us WARRIORS and SONGS OF LOVE AND DEATH. There is a list of the other stories in the anthology here. 2) Where does this story fit into the chronology of the Lord John books and stories? Diana says this story comes after THE SCOTTISH PRISONER. Which is interesting, because "Plague of Zombies" will be published on October 4, and SCOTTISH PRISONER doesn't come out until November 29. We may see references in "Zombies" to events that occur in SCOTTISH PRISONER that we haven't read about yet. For the full list of the order of the Lord John books and stories, look here. 3) How can I get an autographed copy of DOWN THESE STRANGE STREETS? You can order autographed copies of all of Diana Gabaldon's books, including DOWN THESE STRANGE STREETS, from the Poisoned Pen bookstore, in Scottsdale, Arizona. This is Diana's local bookstore, and they ship all over the world. Their staff is very friendly and knowledgeable about Diana's books. 4) Where can I go to discuss "Lord John and the Plague of Zombies"? There is a thread (discussion) about this story, including excerpts, in Diana Gabaldon's section of the Compuserve Books and Writers Community. The thread is here. You can also discuss the story on the LOL Excerpt Board. 5) Will there be an audio version of DOWN THESE STRANGE STREETS? Yes. The audio version will be released on October 4, 2011. You can pre-order it here. 6) What about e-book editions? DOWN THESE STRANGE STREETS is available for pre-order for Kindle, Nook, and probably other e-book readers as well. 7) Why is Diana Gabaldon writing about zombies, of all things? I've never asked, but I suspect it had something to do with the popularity of PRIDE AND PREJUDICE AND ZOMBIES, which had just been published when Diana first began talking about this story several years ago. And for what it's worth, this story takes place in Jamaica. I just found out that Scottish singer Alex Beaton is in the hospital, recovering from a serious spinal-cord injury sustained earlier this month. Look here for details. I heard him perform at the Grandfather Mountain Highland Games last year, and fell in love with his music immediately. <g> I have two CDs of his songs, and listen to them frequently. I was so sorry to hear this news today. I have always imagined that Roger's voice before the hanging sounded something like Alex Beaton's. I don't know if Diana had him in mind as a model for Roger's singing voice or not, but it doesn't matter. His will always be the voice I hear in my head when I think of Roger singing. Please keep Alex Beaton and his family in your thoughts and prayers. I'll add some spoiler space here, in case anyone doesn't want to know yet. Lord John Grey—aristocrat, soldier, and occasional spy—finds himself in possession of a packet of explosive documents that exposes a damning case of corruption against a British officer. But they also hint at a more insidious danger. Time is of the essence as the investigation leads to Ireland, with a baffling message left in “Erse,” the tongue favored by Scottish Highlanders. Lord John recognizes the language all too well from his time as governor of Ardsmuir Prison, when it was full of Jacobite prisoners, including a certain Jamie Fraser. Please note: as many of you know, I'm an excerpt-avoider. It's fine to discuss this summary description here on my blog if you want to, but please don't refer to the specifics of any excerpts from SCOTTISH PRISONER. I really don't want to know yet. Thank you for your cooperation. Yesterday was a very special day for Diana Gabaldon and a lucky group of OUTLANDER fans from the Ladies of Lallybroch. For Christmas 2010 and her birthday in January 2011, The Ladies of Lallybroch (TM) dedicated a bench at Culloden House to Diana. July 25, 2011, Judy Lowstuter and Elenna Loughlin met with Diana and unveiled her bench on behalf of LOL. Check out the slideshow of photos here. Lovely day lolling at Culloden House, and sitting (ceremoniously) on the new "Diana Gabaldon" bench in the beautiful garden--thanks to LOL! LOL being the delightful Ladies of Lallybroch--especially Judy Lowstuter of Celtic Journeys, who thought up the bench (LOL paid for it). The Ladies put a nice plaque on the bench: "DIANA GABALDON, Given by the Ladies of Lallybroch, 2011". Congratulations to Judie R., Judy Lowstuter, Elenna Loughlin, and everyone else involved! What a wonderful tribute to Diana. I hope to be able to see this bench in person some day, if I ever make it to Scotland. Note the new title, THE SCOTTISH PRISONER, with "A Lord John Novel" in small print at the bottom. What do you all think of this cover? All opinions, pro and con, welcome. <g> There is a thread on Compuserve about the new cover art here, if you want to tell Diana what you think. You may have noticed that I'm trying out a new format for the monthly poll. I decided I didn't like the poll options Blogger provides (too restrictive, no way to let users type in their own choices for "Other", no control over fonts or colors, etc.) and so I have switched to a poll widget hosted by PollDaddy.com. If you have already voted in the July poll, there's no need to vote again. I copied all of the results from the previous poll into the new format. Please let me know if you have any problems accessing the new poll, either to vote or to see the results. (And if you are having problems, it would help to know what web browser you're using. I tested it on Firefox and IE.) Thanks! Just wanted to come by in person to thank you all--so much!--for the wonderful book of essays. They're delightful: funny, heart-wrenching, and everything in between. Thanks so much for giving me these little pieces of yourselves; I treasure them. Needless to say, I'm just DELIGHTED with her response! I wanted to make sure everyone here saw it, because it's really intended not just for me, but for all of you, the readers of Outlandish Observations, who took the time to put your thoughts down in writing and send them to me. I couldn't have done it without you! 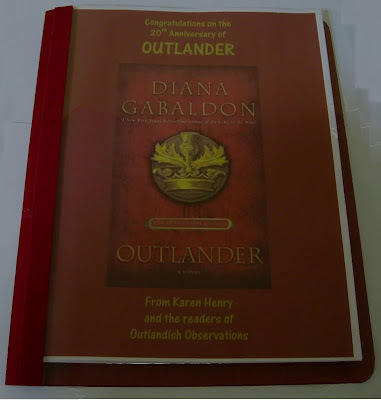 I know many of you have been wondering what Diana Gabaldon thinks of the collection of essays I sent her from the OUTLANDER 20th Anniversary Contest. Here is a picture of the final collection that I mailed to her. I did! And thank you IMMENSELY! I was saving it to open once SCOTTISH PRISONER was done <g>, so did open it last night, after the launch party at the Poisoned Pen. I've only had time enough to read the first few essays, but they're wonderful--touching, funny, and just amazingly lovely. Thanks so much, and yes, of course I'll come by the blog to say thanks in person. 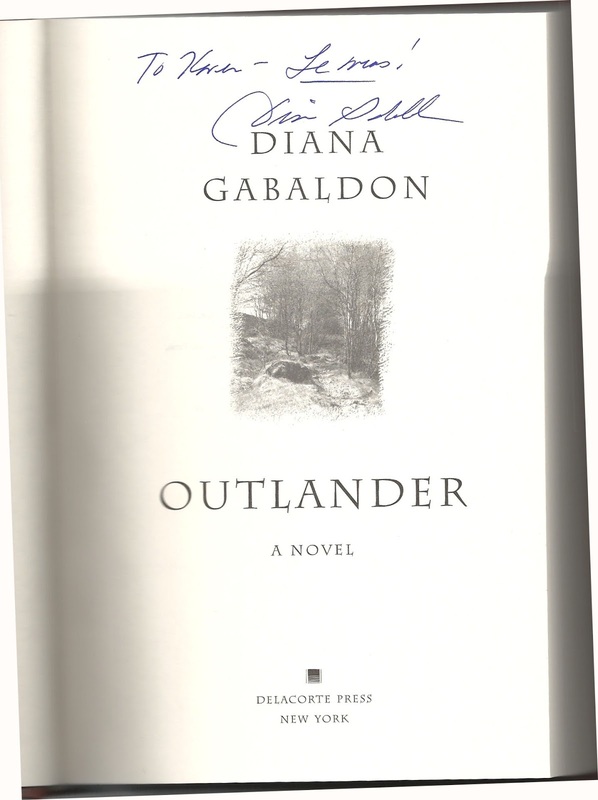 And speaking of reactions <g>....my autographed copy of the 20th Anniversary Edition of OUTLANDER arrived from the Poisoned Pen this afternoon. I think it was worth the wait, and the extra money, to get a signed copy. - I love the look of this book. Very elegant! There is something about the "faux-leather" cover that makes me want to squeeze it over and over, just for the pleasure of how it feels in my hands. I like the ribbon bookmark very much; it's longer than I expected, and the color is lovely. - The lengthy description of Diana's writing process was fascinating, even though I'd seen some parts of it before. The part that is new to me is the detailed explanation (starting on page 634) of how she fiddles with every word in every sentence, to get it just right. No wonder it takes her so long to finish a book, if she's spending this much time and effort fine-tuning every sentence! - Kudos to my friend Cathy MacGregor for the wonderful Reader's Guide to OUTLANDER that is included with this book. She clearly put a lot of time and thought into it, and it shows. I hope we'll see similar Reader's Guides for the other books, eventually. - I will miss that striking blue cover, which is the reason OUTLANDER caught my attention in the bookstore almost five years ago. - I didn't really care for the new song on the OUTLANDER: The Musical sample CD. (Although the other three songs are some of my favorites.) I will have to listen to it a few more times just to be sure, but my first reaction was that the songwriter didn't really get the relationship between Claire and Dougal very well. Too bad. On the whole, I'm quite pleased with the 20th Anniversary Edition. If you've seen it, please let us know what you think of it! I noticed this morning that Diana Gabaldon's upcoming novel, THE SCOTTISH PRISONER, is finally available for pre-order in hardcover from Amazon.com. It is not easy to find on Amazon's site, but it's there. It's also available for pre-order at other major bookstore chains, such as Barnes & Noble in the US, and Chapters in Canada. For information on e-book editions of SCOTTISH PRISONER, look here. Diana has confirmed that the book will be released in the US, Canada, and the UK on November 29, 2011. 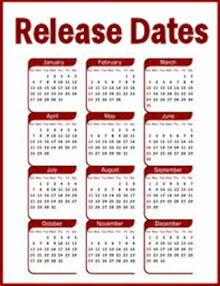 Now that we have a definite publication date (November 29, 2011) for THE SCOTTISH PRISONER, I have added a countdown widget to my blog. I hope you like it! I also need to a) finish pasting in the missing bits of Section V, read it to and fro and tweak anything that may need it, break the chapters and title them (it's a short section; I think there are only four or five chapters), b) unpack and do all the laundry (as I have to repack everything for Scotland in three days), and c) rush by the Poisoned Pen and sign as many of the pre-ordered 20th-anniversary OUTLANDERS as time permits (I'll do the rest on Monday, before the launch event, if I don't manage them all tomorrow)--the Pen says they have about 500 orders needing personalized inscriptions, and those take a lot longer to do than the straight signatures. 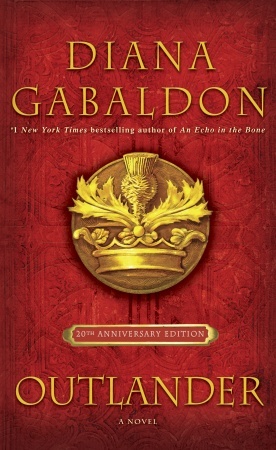 I am really looking forward to getting my copy of the 20th Anniversary Edition of OUTLANDER. Have any of you seen it, and if so, what do you think of the look of it? The special features? Would you recommend it to other fans? "LiveStream event with me and Jim Rollins today! http://t.co/k0uCbmu"
This is at 2pm ET today, July 8th. I have no idea if people in other countries will be able to see it, but it's worth a try. Happy Independence Day to all of you in the US! 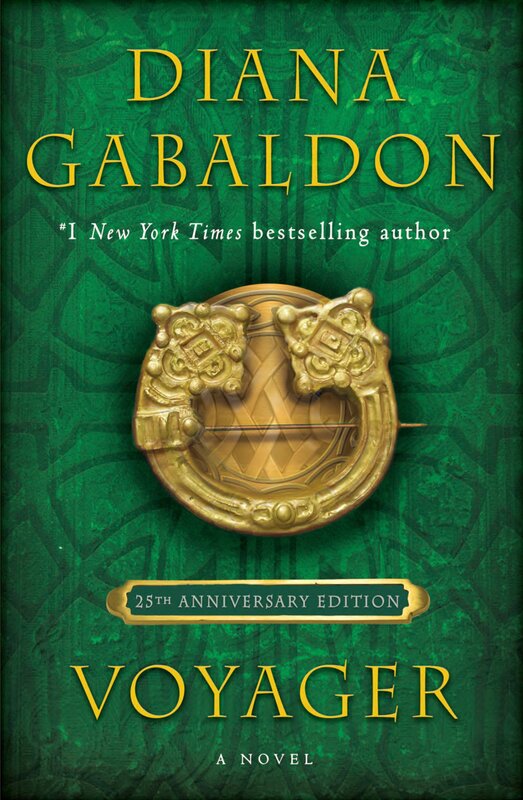 As many of you know, the special 20th Anniversary Edition of OUTLANDER will be published on Tuesday, July 5th, in the US and Canada. I have put together a FAQ about the 20th Anniversary Edition; I hope it's helpful. 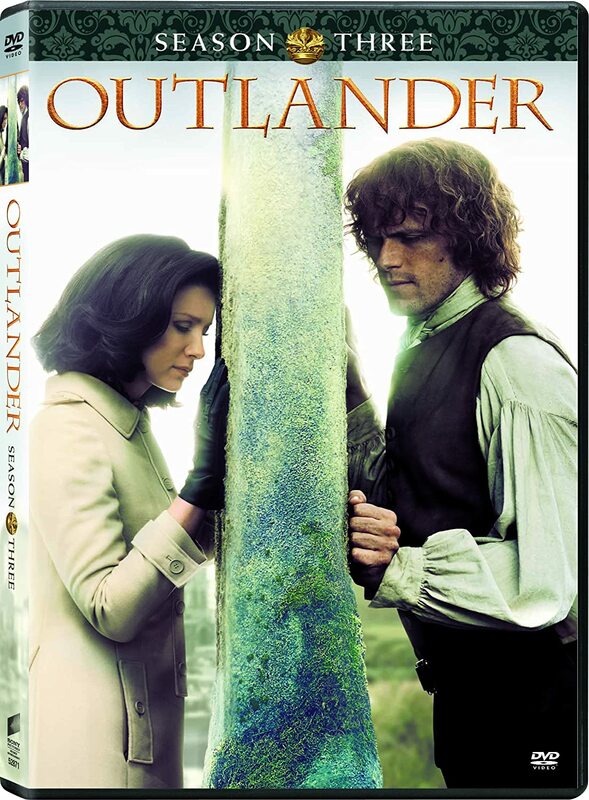 If you are on Twitter, you can help us celebrate the publication of the 20th Anniversary Edition by tagging your tweets on July 5th with #Outlander20. (Thanks to Susan McCreadie, aka the_bothy on Twitter, for the suggestion!) When I mentioned this idea to Diana on Twitter the other day, her response was, "#Outlander20 sounds like a great idea to me!" Please help us get the word out to all the OUTLANDER fans on Twitter. And even if you don't have a Twitter account, you can see all the #Outlander20 tweets here. 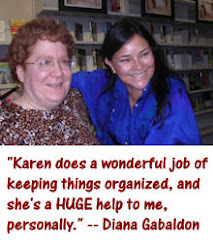 You can see Diana Gabaldon's tweets here. She's Writer_DG on Twitter. Tomorrow should be a fun day. I'm looking forward to seeing what everyone thinks of the extras included in the new book. 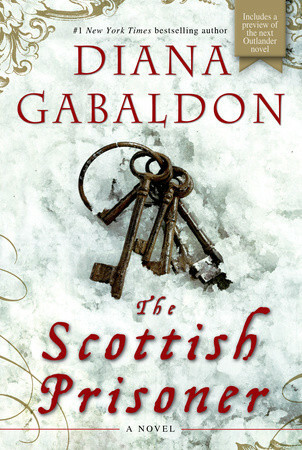 It's official -- Diana Gabaldon's novel THE SCOTTISH PRISONER will be published on Tuesday, November 29, 2011! The book is still not listed on Amazon's US site, but I found this on Random House's Diana Gabaldon page, with the release date listed as November 29. And it's available for pre-order (in both hardcover and e-book format) on the Barnes & Noble site here. This is very exciting news! Please pass it on to anyone else you know who may be interested. I posted this last year, and it seems appropriate to mention it again. Wishing all of you in the U.S. a very happy Fourth of July! You can get "1776" via Amazon here. It's also available on Netflix and Blockbuster. Hope you enjoy it as much as I do! I asked the winner of the OUTLANDER 20th Anniversary Contest, Rinah Benoliel, if she would let me post her contest entry so that the rest of you can see it. Rinah has kindly agreed, so here it is. Thanks, Rinah! Outlander and I go way back. Actually, it was my mother who first introduced me to Outlander, back in the late- 90s. Though books about time travel weren’t my “thing” I gave them a try and devoured the four books that were available at that time. I loved the books, but didn’t follow the series any further. Then, last year, a close friend mentioned she was reading the best book called Outlander and I had to read it. Once she described it, I thought it sounded familiar and realized I had already read Outlander before. I immediately started reading the first book again, and I was hooked from the start. I read straight through Book 7 and have enjoyed every moment. For me, reading is generally a solitary experience; it is my relaxation and escape. The Outlander series fulfills that (in a big way), but it has also become part of an incredible social experience for me. There is a group of four of us now (local friends), who have read all the books, sometimes at the same place in the series, sometimes ahead or behind each other. But every time we get together, we talk Outlander. We giggle, fantasize, analyze and compare, all about Outlander!!! Anytime anyone of us sees a reference about Scotland or time travel, from articles on Stonehenge to a 5K Kilt Run, we share it with each other. We all have busy family lives and lots of responsibilities, but Outlander is just for us. It is our escape from real life, an indulgence and a pleasure shared between girlfriends. I have never read anything like these books, or been able to connect to other people through books like I have with Outlander. Our trip to Scotland is pushed off for a while until the kids are bigger…but we’ll make it there one day!!! Congratulations, Rinah!! Your name was randomly selected from among the 77 entries I received for the contest. I just sent you an email requesting your mailing address, and how you would like Diana to inscribe your copy of the 20th Anniversary Edition. Please send me an email back as soon as possible so I can put the order in to the Poisoned Pen bookstore in Arizona. Many, many thanks to all of you who took the time to send in contest entries!! I know that wasn't easy! I received essays from fans all over the world, including countries as far away as Latvia, Finland, and Australia. I plan to put the package in the mail to Diana in the next few days. She is traveling at the moment and won't be back home until July 10, so I don't expect to hear her reaction until then. 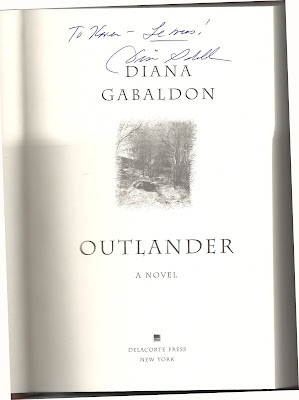 Are you planning to buy the 20th Anniversary edition of OUTLANDER? 30.8% - Yes, definitely! I've already pre-ordered the book or will do so soon. 25.1% - Yes! I can't wait to see all the extras that will be included in it. 13.7% - I'm not sure yet. 9.3% - I've entered the contest to win a signed copy, or plan to do so soon. 6.2% - No, I already have a hardcover copy of OUTLANDER. 4.8% - No, it's too expensive. 4.4% - No, it's not available where I live. 3.1% - No, I'm not interested in the special features. 1.3% - What 20th anniversary edition? There were 227 votes in this month's poll. Thanks so much to everyone who participated! I didn't vote in the poll myself, but I fall into the first category. I pre-ordered a signed copy from the Poisoned Pen bookstore (Diana's local bookstore in Scottsdale, AZ.) The staff there is very helpful and knowledgeable about Diana's books, and Diana says they ship all over the world. In keeping with the 20th Anniversary theme for this month, the July poll question is about how long you've been reading the books. Please take a moment to vote. Thanks!